Objective: Low back pain (LBP) has considered the most common problem worldwide. The purpose of this study was to see the comparative efficacy of lumbar stabilization exercises versus Mulligan mobilization in LBP. Materials and Methods: This randomized controlled trial was conducted at Physiotherapy Department of Mayo Hospital, Lahore. Forty-four patients were randomly selected in two groups. Group A patients were treated by stabilization exercises. Group B patients were treated by Mulligan mobilization protocol. Results: The participants in Mulligan mobilization group showed marked improvement as compared to stabilization exercise group. Conclusion: It was concluded from the results of this study that Mulligan mobilization is more effective than stabilization exercises for the treatment of LBP. Mulligan mobilization not only decreases pain but also improves function and flexibility of the spine. هدف: آلام أسفل الظهر تعتبر المشكلة الأكثر شيوعا في جميع أنحاء العالم. وكان الغرض من هذه الدراسة معرفة الفعالية المقارنة لتمارين تثبيت قطني مقابل بروتوكول "تحريك موليجان" . المواد والطرق: أجريت هذه التجربة العشوائية ذات العينة الضابطة في قسم العلاج الطبيعي في مستشفى مايو، لاهور. وتم اختيار أربعة وأربعين مريضا عشوائيا في مجموعتين. تم علاج مرضى المجموعة أ من خلال تمارين التثبيت. تم علاج مرضى المجموعة ب من قبل بروتوكول "تحريك موليجان". النتائج: أظهر المشاركون في مجموعة بروتوكول "تحريك موليجان" تحسنا ملحوظا بالمقارنة مع مجموعة ممارسة الاستقرار. Low back pain (LBP) has been the most common problem in the 20th century, and now, it is known as worldwide. It is seen that majority people experience pain in the back in their life. The prevalence ranges up to 84%. In the UK, the prevalence was 417 patients out of 10,000 with the incidence of 80%. LBP occurs anytime in life. About 80%–90% of people will recover without treatment in 1½ month. After the first episode of LBP, the pain will again occur in 60%–86% of people in the same year. Chronic LBP is becoming so common with 40% of patients having pain at 6 months while 33% have it at 1 to 2 years. People did not come for treatment because of their financial issues. LBP in most of the cases is nonspecific (such as poor posture, stress, and anxiety), but in about 10% of cases, a specific cause (such as cauda equina syndrome, spinal stenosis, and ankylosing spondylitis) is identified., In about 30%–35% of patients, the cause of LBP is due to translational and rotational movements of vertebrae which is called lumbar segmental instability., Rotation in L1–L5 is 7°–13° and translation in L1–S1 is 3–4 mm, these are considered to be the normal values for the movements which occur at intervertebral joints,, increased in the values in the patients with CMLBP is due to any impairment in the element which is controlling movement. Intervertebral movements and stability are controlled by local muscles of lumbar which plays an important role in it. Mulligan introduced a new technique in manual therapy, which has a great role in the treatment of LBP. The concept involves the sustained end range overpressure with the active movement in an impaired direction which previously occurs with pain now occurs painlessly. The techniques are called mobilizations with movement (MWM) or sustained natural apophyseal glides (SNAGs). MWM is effective and useful if it reduces pain and increases range of movement (ROM) and provides immediate results. This technique improves the mobility of the restricted joints and decreases symptoms. Research shows that exercises have a great effect in increasing muscle mass and endurance strength. There may be an increasing evidence that in the LBP, lumbar multifidus and transverse abdominal muscles are most commonly affected. According to a study in patients with LBP and multifidus atrophy, lumber stabilization exercises play a significant role in increasing muscle mass which was targeted for multifidus muscle. Segmental movements are affected by impairments in the surrounding muscles, so these muscles can be trained by specific lumber stabilization exercises to improve intervertebral movement results in increased segmental stabilization. It is supposed that pain is reduced due to improvement in stability. Hence, the segmental stabilizing exercises can be effective in treating lower back pain and disability. Evidence was less in which stability exercises and other physiotherapy equally treated the pain and disability as compared to physiotherapy alone in LBP. The main purpose of the study was to study the comparative effectiveness of stability exercises of spine versus Mulligan mobilization with movement in nonspecific chronic LBP. It was a randomized controlled clinical trial and conducted at physiotherapy department of Mayo Hospital, Lahore. Forty-four participants were selected based on specific criteria [Table 1] and allocated 22 participants in Groups A and B. Group A participants were treated with lumbar stabilization exercises, and Group B were treated with Mulligan mobilization with movement. Consent was taken from each patient and ethical consideration approval was taken from the local ethical committee. After physical examination by the therapist, the data were collected. It includes both subject and objective examination. The data include demographic information including age, gender, medical history, socioeconomic status, marital status, and educational status, duration of onset nature, and location of symptoms. The Numeric Pain Rating Scale (NPRS) is a reliable and valid instrument to assess pain. Patients who received the intervention of stabilization exercises and Mulligan mobilization were interviewed for pain and range of motion. Oswestry scale was used to examine the outcomes. Data presented in mean and analyzed using independent t-test. SPSS software version 17(SPSS for Windows, SPSS Inc., Chicago, IL, USA) was used for statistical analysis. P < 31.05 was taken as statistical significant. After the study period, a significant improvement in pain was found in MWM versus stabilization exercise group by assessing NPRS [Figure 1]. Changes in Oswestry score were more prominent in Mulligan mobilization with movement group after the treatment time [Figure 2]. The range of motion in all direction was improved in both groups but improved was marked in MWM group [Figure 3]. Low back is supported by back muscles which provide stabilization and prevents LBP. Muscles of the back involve multifidus, transverse abdomens. Strength and flexibility of the back muscles are enhanced by stabilization exercises in a pain-free range. Deep abdominal muscles are strengthened to provide the stability. These exercises help the patient in the management of LBP by increasing the strength, coordination, and knowledge of posture. Patients with LBP undergo regular sessions of physical therapy including hot pack, ultrasound, postural care advice, and therapeutic exercises. Lumbar stabilization exercise protocols focus on the muscles of the spine that are involved in the exercise. Stabilization exercises reduce pain, improve function, and provide strength to the trunk muscles and back extensors. General stabilization exercises are basically to improve flexibility, and according to studies, these are not so beneficial. These are very old exercises and do not have the capacity to involve all the spinal muscles, so they control spine in different postures. In acute cases, these exercises are recommended because they are comfortable, easy to perform, and patient can learn it.Most of the researchers show the effect of stabilization exercises on reducing pain and improving normal performance in chronic LBP patients. Studies investigated that lumbar stabilizer muscles may be functionally impaired in some pathological conditions which result in the disturbed stability of the adjacent structures. Kong et al. investigate that if the muscle does not function properly, it destabilizes the spine and affects the normal function of the other spinal segments. The results of this research study show that the Mulligan mobilization with movement technique in the management of CLBP can manage better pain, disability, and ROM as compared to stabilization exercises. MWM is a technique in manual therapy which is commonly used in the treatment of musculoskeletal problems. Both the groups in the study show significant improvements, but results show that the Group B Mulligan group shows better results than Group A stabilization exercises. According to the statistical analysis, there is a marked decrease in the pre- and postintervention scores of pain, ROM, and disability in both the groups. In this manual technique, physiotherapist applies a SNAG to the lumbar spine and patient actively moves in the direction of the impairment; it is performed in weight-bearing positions. According to this study Mulligan, MWM applied to the patients having LBP shows significant and immediate effectiveness in pain and ROM in pre- and postinterventional score. Very few researchers were found in which these two techniques were compared in the management chronic nonspecific LBP, but literature was found that these techniques were used alone or in combination with other physiotherapy treatments to check the effectiveness. Vingård E, Mortimer M, Wiktorin C, Pernold RP, Fredriksson K, Németh G, et al. 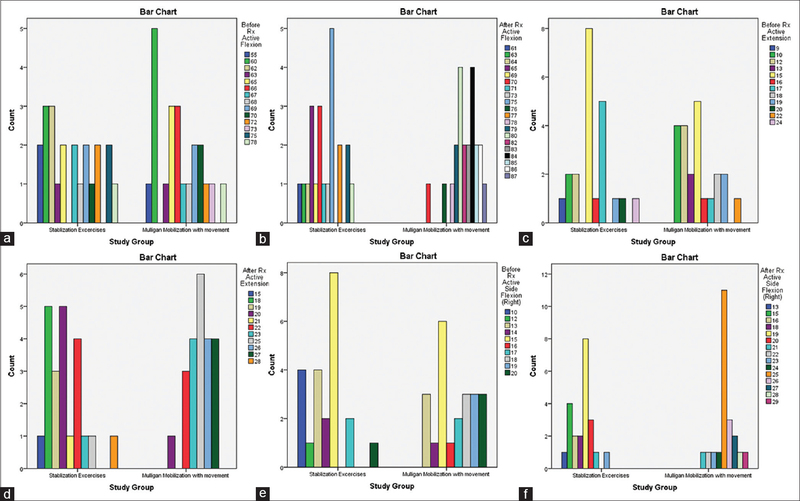 Seeking care for low back pain in the general population: A two-year follow-up study: Results from the MUSIC-Norrtälje study. Spine (Phila Pa 1976) 2002;27:2159-65. Pellisé F, Balagué F, Rajmil L, Cedraschi C, Aguirre M, Fontecha CG, et al. Prevalence of low back pain and its effect on health-related quality of life in adolescents. Arch Pediatr Adolesc Med 2009;163:65-71. Chou R, Qaseem A, Snow V, Casey D, Cross JT Jr., Shekelle P, et al. Diagnosis and treatment of low back pain: A joint clinical practice guideline from the American College of Physicians and the American Pain Society. Ann Intern Med 2007;147:478-91. Krismer M, Van Tulder M. Low back pain (non-specific). Best Pract Res Clin Rheumatol 2007;21:77-91. O'Sullivan PB. Lumbar segmental 'instability': Clinical presentation and specific stabilizing exercise management. Man Ther 2000;5:2-12. Jang SY, Kong MH, Hymanson HJ, Jin TK, Song KY, Wang JC, et al. Radiographic parameters of segmental instability in lumbar spine using kinetic MRI. J Korean Neurosurg Soc 2009;45:24-31. Alam WC. Radiological evaluation of lumbar intervertebral instability. Indian J Aerospace Med 2002;46:48-53. Hayes MA, Howard TC, Gruel CR, Kopta JA. Roentgenographic evaluation of lumbar spine flexion-extension in asymptomatic individuals. Spine (Phila Pa 1976) 1989;14:327-31. Kong MH, Hymanson HJ, Song KY, Chin DK, Cho YE, Yoon DH, et al. Kinetic magnetic resonance imaging analysis of abnormal segmental motion of the functional spine unit. J Neurosurg Spine 2009;10:357-65. Lederman E. The myth of core stability. J Bodyw Mov Ther 2010;14:84-98. Vicenzino B, Paungmali A, Teys P. Mulligan's mobilization-with-movement, positional faults and pain relief: Current concepts from a critical review of literature. Man Ther 2007;12:98-108. Hicks GE, Fritz JM, Delitto A, McGill SM. Preliminary development of a clinical prediction rule for determining which patients with low back pain will respond to a stabilization exercise program. Arch Phys Med Rehabil 2005;86:1753-62. Panjabi MM. 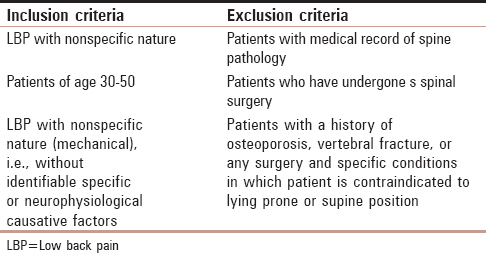 Clinical spinal instability and low back pain. J Electromyogr Kinesiol 2003;13:371-9. Panjabi MM. The stabilizing system of the spine. Part I. Function, dysfunction, adaptation, and enhancement. J Spinal Disord 1992;5:383-9.
van Tulder M, Furlan A, Bombardier C, Bouter L; Editorial Board of the Cochrane Collaboration Back Review Group. Updated method guidelines for systematic reviews in the Cochrane Collaboration Back Review Group. Spine (Phila Pa 1976) 2003;28:1290-9.